Some said that it was a strong programme at Pordenone this year. But maybe they were misheard and what they really said as that you had to be strong for the programme at Pordenone this year. It certainly felt that way as we faced up to the epic offering on Monday morning, Ai Yo Jinrui To Tomo Ni Are (Love, Be With Humanity) (Japan 1931), all four hours and one minute of it. It took up the entire morning and the screening had to start half an hour earlier than usual, at 8:30, to fit it in. I will confess that I lingered over breakfast and did not get to the Verdi until 9.00, where I expected to catch five minutes of the film and then head out for a coffee somewhere. But I got hooked. This wasn’t directed by Shimizu, it was the work of Shimazu (Yasujiro Shimazu), and what a difference the change in vowel made. This was as polished and authoritative a piece of direction as you could hope to find, aided by some outstanding performances. Love, Be With Humanity (is the title really that dreadful in Japanese too?) was the dramatic highlight of the festival so far. The story was pure Peyton Place, or Jeffrey Archer. A rich, selfish father, superbly played by Sojin Kaminyama (who had returned to Japan after a period in Hollywood appearing in The Thief of Bagdad and as Charlie Chan), is deservedly saddled with four ungrateful, awkward children, each of different mothers. One is a wealthy wife most interested in jewelry than her child, another daughter is getting married, one son is a cold, intellectual, the other son is a fiery rebel (played by Denmei Suzuki) who refuses to take any money from his father, after the way his mother died wretchedly. The stage is set for a soap opera of epic proportions and concomitant confusion, but unlike his near namesake Shimazu so ably managed the interlocking elements of his narrative that you were never lost, and never impatient, despite the indulgent running time. In the end the father is ruined and the only child who cares for him is the rebellious son. Their climactic argument, where they trade insults yet the son’s wife recognises that they have actually already forgiven one another, exemplified the intelligent approach, constantly playing against expectation, that characterised the film. And then there was the final reel. No one who was there is likely to forget it in a hurry. Father and son have emigrated to the USA, and taken up the cowboy life. The intertitles have switched from Japanese to English, and the whole conclusion, with stetsons, cowboy boots, beaming neighours and the home on the range, just boggled the mind. Doubtless it all rang true in Japan, but here we couldn’t quite believe our eyes. And then it was over, and there was huge applause for pianist Mie Yanashita, whose vivid accompaniment had been subtly attuned throughout to the film’s ebbs and flows, but it was sort of applause for ourselves as well for having made it all the way through. I had been looking forward to the afternoon’s first offering. André Deed is generally thought of as one of the great non-American comic performers of the silent cinema period. He was a music hall comedian who joined the film business in 1901 with Georges Méliès in 1901, moving to Pathé in 1906. The character that he established, Boireau, became progressively popular throughout Europe and effectively established the idea of the comic character appearing in a series of films. He moved to Italy in 1908, establishing a new character, Cretinetti, for the Itala company (known as Foolshead in English) and it is Cretinetti films that I’ve long revered for their energetic style and clever mixture of half-wittedness with quick-wittedness. He returned to Pathé in 1911 and became Boireau once more before his career faded with the onset of the First World War. Pordenone was presenting a strand on French comedy films (a speciality of festival director David Robinson) so it was Boireau that we got on Monday afternoon, ten titles, of which two were from his first period with Pathé, eight from his second. Sadly they were a huge disappointment. Deed mugged and gurned for all he was worth in a series of sloppily conceived scenarios that were resolutely unfunny. In the place of any visual invention we got face-pulling from Deed and much laughter directed at the camera from other performers – it’s always a bad sign when the actors feel obliged to laugh at the comic business, when that is our business. Alas, Boireau on this evidence was tedious, certainly no match for Cretinetti. Variety is guaranteed at Pordenone. From pre-war French comedy we moved to late 20s Soviet cinema. One of the festival’s main strands was ‘Three Soviet Careers’, looking at the work of Mikhail Kalatozov, Abram Room and Lev Push. 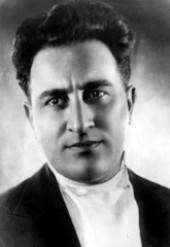 Lursmani Cheqmashi (The Nail in the Boot) (USSR 1931) was made by Georgian director Mikhail Kalatozishvili, who as Kalatozov would gain international fame for The Cranes are Flying (1957) and I Am Cuba (1964). His documentary films of the late 20s/early 30s were characterised by a truly extraordinary visual style but also a muddled ideology that saw them fall foul of Stalin’s censors. The Nail in the Boot adapts the old tale of the nail eventually causing some great disaster as things build up because the original small irritation was not dealt with (“and all for the want of a horseshoe nail”). A group of soldiers in an armoured train come under attack. One of their number goes off to find help, but because of a nail in his boot he is hampered in his journey and the battle is lost. He is the subjected to a trial, where he comes in for intense criticism but eventually successfully argues his case. The film was roundly criticised by the Soviets (particularly the Army) for being confusing and ideologically unsound, as a consequence of which it was banned. Seeing it now you have some sympathy with those critics. The nail theory is ridiculous, and the succession of calamities that befalls the soldier encourages our sympathies not our censure, so that he seems cruelly victimised by the subsequent show trial. Whosever’s fault it was that the armoured train was lost, it was surely not his. If there was a message there at all, it was not one that any true Soviet would wish to champion. But in truth there is no message there at all. The Nail in the Boot is an exercise in pure cinematic style. No doubt Kalatosov was driven by some ideological certainties, but his camera drove him elsewhere. It is just an astonishing film to experience. Every image is burnished to perfection. The stylised results look like nothing on earth. There are the statuesque faces, the unreal landscapes, the astonishing shots from within gun barrels, the eerie intensity of the court room. It is cinematically brilliant – except that cinematic must mean more than technique, it must be technique applied to a particular and consistent aim. Here Kalatozov fails – but what an extraordinary failure. Talking of extraordinary things, Stephen Horne‘s music was a multi-instrumental tour de force. Some may have though that there was a piano, accordion and flute trio accompanying the film, but no, it was the one man. Stephen can so far only play two of those three instruments at the same time, but it surely can’t be long before he is able to add the third as well. Anthropology was an unexpected sub-theme of the festival. Next up came The Masks of Mer (UK 2010), a documentary made by Michael Eaton about the Cambridge Anthropological Expedition of 1898 to the Torres Strait islands to the north of Australia. The expedition was led by Alfred Cort Haddon, a zoologist who became so fascinated by the native people he met on the islands when he first visited them in 1888 that he returned a decade later to study the humans. Remarkably he took with him not just notebooks to record his findings, but a phonograph to record songs and speech, and a motion picture camera. The films survive, and form the centrepiece of Eaton’s fascinating and rather wise film. 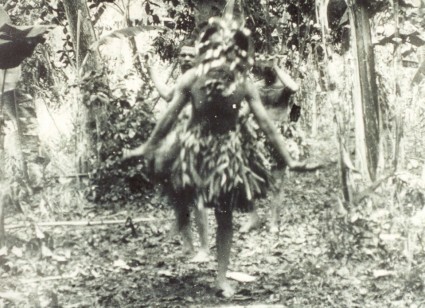 Haddon only received his camera a day or two before he was due to leave, but he captured short scenes of fire-making, of dances by some visiting Australian Aborigines, and most remarkable of all a Malu cult initiation ceremony dance which had had been suppressed by Christian missionaries. Haddon invited the people of the island of Mer to recreate three sacred masks (out of cardboard) which were essential to the ceremony and got them perform the forbidden dance for the camera. Some might think that this recreation falsifies the value of the film and the anthropological study, but Eaton argues persuasively that the collaborative nature of the film – Haddon working closely and sympathetically with his subjects – displays a deeper truth. Just pointing a camera at actuality does not reveal its true substance. It is what its subjects wanted to be shown that counts. This was as much the Torres Straits islanders’ film as it was Haddon’s, and that what was so extraordinary about Haddon, that he recognised this. The film also runs the sound recordings alongside the films. The two were not recorded together, but Haddon certainly exhibited them together (in 1906, if not before), so the experiment was justified. The film’s most magical moment was when Eaton visited Cambridge University and was shown the very masks that appear in the film, lovingly stored in the Haddon archive. It was a mysteriously moving moment. Anyway, a fine documentary of the kind you just don’t see on television any more. So that was the afternoon done. Supper was spent in conversation about archives, exhibitions, scholarly project and the rich subject of colour, the fruits of which you may learn of at some other time. But then it was time to hurry back to the Verdi for the great treat of the evening, a film I had been waiting twenty years to see, ever since Kevin Brownlow programmed it at the National Film Theatre, describing it as one of the most amazing visual spectacles of the silent era, and for some reason I was unable to see it. This was going to be good. Le Miracle des Loups (The Miracle of the Wolves) (France 1924) has a reputation as one of the highpoints of French silent cinema. It is set in the fifteenth century during the reign of Louis XI (Charles Dullin) and it tells of the challenge to the king’s authority by the rebellious Charles the Bold, Duke of Burgundy (Vanni Marcoux), while rival noblemen fight over heroine Jeanne Fouquet, played by Yvonne Sergyl. The film, directed by Raymond Bernard, is on a truly epic scale, with setpieces of the battle of Montlhéry and the siege of the castle of Beauvais which are meant to show off the millions of francs that were clearly spent on them. Romance, rivalry, intrigue, violence, spectacle, all in the hands of a skilled director – what could possibly go wrong? Oh dear, oh dear. Right from the start it was clear that something was wrong, when the prelude introduced us to the romance between Jeanne and Tobert Cotterau, played by the toe-curlingly unromantic-looking Romauld Joubé, during which she gets her pet dog to pass a message to him by lifting the bewildered dog over a wall. On top of this we were fed long and tedious intertitles filling us in on all the history, with all of the unwelcome earnestness of a history teacher of very much the old school. It set the tone for the disaster that was to unfold before us over the next two hours or more. A more turgid plod of a movie it would be hard to imagine. What it did remind me of, in fact, is a 1909 Gaumont one-reeler, Le Huguenot, which crams in a complex plot with too many characters, overlong intertitles obsessed with pedantic detail, all put over with histrionic performances strong on gesture and redundant when it comes to human feeling. The Miracle of the Wolves is simply a 1909 historical film stretched out to 130 minutes. It was so half-hearted throughout. 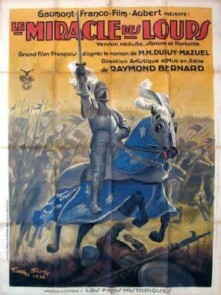 The performances were lethargic (particularly Charles Dullin, who tried to look Machivellian but just looked like he was struggling to remember where he was), and even the battle scenes were undercooked (despite some bloody examples of what fighting in the Middle Ages was actually like), with extras just about going through the motions. The key scene was the miracle itself. Jeanne is being pursued by the evil Comte du Lau (Gaston Modot, chewing up the scenery) in the mountainside snows when she is surrounded by wolves, who settle down around her before attacking the Comte’s men. We were meant to be awe-struck – instead all too many of the audience laughted heartily at the scene’s absurd piety. All in all, a film without any heart at all. I’d waited twenty years to see it and it felt like twenty years watching it. 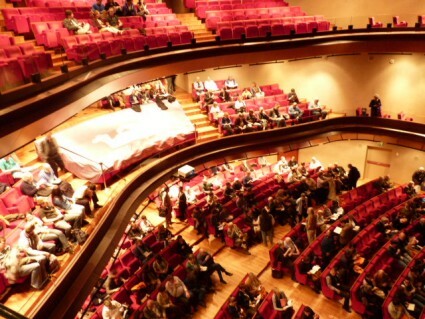 There was some historical interest in the screening for which Touve Ratovondrahety played a piano transcription of Henri Rabaud’s original score, but to be honest it had little to stir the imagination. But then it had such poor material to work with. Oh dear oh dear. But there would be better fare on the morrow. It’s funny how Le Miracle des Loups was such a failure for you. I saw it in much worse conditions, on a video screen without music and I enjoyed it thoroughly. I loved the casting including Romuald Joubé (who is also great in many Antoine pictures). I guess a piano reduction of the Rabaud score can’t provide the richness of his orchestration (as his score for Le Joueur d’Echecs testify). I guess if you don’t know French history, the Dupuy-Mazuel script must be quite obscure. Perhaps you need to revisit it at some point! Well I’m glad someone (and presumably others) enjoyed it. Thanks for having said so. I do know a little of French history – it was the schoolmasterly tone with the insistence on names, events and dates that I found unilluminating. One day, when I’m brave, I’ll revisit it – and hope to be proved wrong.